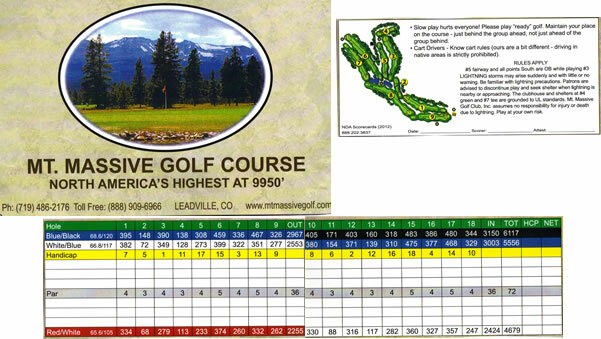 Mount Massive Golf Course is a nine-hole public course on the outskirts of Leadville. Set in the open spaces of the Arkansas River Valley near the river's headwaters, ringed by the tallest mountains in the state, surrounded by ranchland and forest, it has a truly spectacular setting. 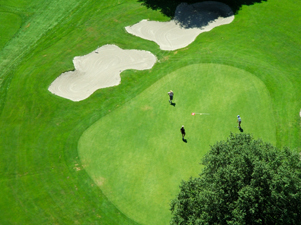 Golf has been played on the site since the 1930s, originally on sagebrush fairways and sand greens. In the early 1970s, a $50,000 grant provided the funds for a single-row automated irrigation system. The irrigation system allowed Mount Massive to establish turf and to begin thinking of itself as a real golf course. Mostly dependent on donations and modest membership revenues, a few caring folks nurtured and tended the course into the late 1980's. As the tourism-driven regional economy boomed through the 1990's, Mount Massive saw a steady increase in daily-fee play and revenue. This led to hiring a full-time superintendent and staff, which led to improved maintenance and operations. The original irrigation system was replaced by a state of the art system in 2001, aiding in conservation efforts and further improving the already excellent turf conditions.